Music Psychos: The Artful Vandelays are back! The Artful Vandelays are back! After three months of near silence; the progressive rock quartet staged a strong return to the stage at Rancho Relaxo on December 14th, along with their new guitarist, Bryen Shi. I am not saying it because he is my friend, or co-writer. Anybody who reads this blog should know how brutal I can be during show reviews. The moment The “new” Artful Vandelays appeared on the stage, you could feel the fan’s excitement in the air building to the max. The new addition is very positive – the sound of the band has changed drastically: The live show was more edgy and powerful than their latest EP. Bryen is a guitarist who does not fear to be different. He was on the stage to simply enjoy the music he played with the band. He improvised riffs and made some changes, but it was a fun part of live show! I have to admit, I am so ashamed of myself that I had not noticed how amazing Kevin’s bass playing was until now. Kevin blew my mind when they played one of my favourite songs, “Sign Language”. In the last few shows that I attended of theirs in the summer I was overwhelmed by Anton's powerful vocals and Braedan's complex drumming. I thought they were the strongest players of the band. Yet, I was all wrong. 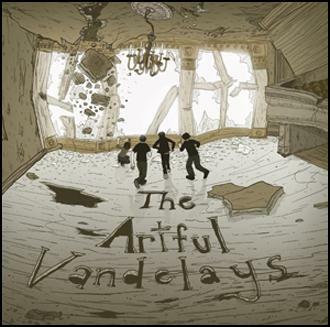 Kevin’s intricate rhythms and Bryen’s style of playing is a perfect match - The Artful Vandelays are now complete… I will now proudly claim that I am the biggest fan of this band. One thing though I have to mention... The last song, "Tenterhooks" was not strong enough to end the show with. I felt the energy of the show deescalated in that last song. If you missed the December 14th show, don't be sad! I have great news for you! They will play again on December 23rd (right on time for Christmas!) at The Smiling Buddha Bar (961 College Street West) AND it’s only a $2.00 cover! Click here to check out the details of the show and you will see me there before I go home for Christmas!